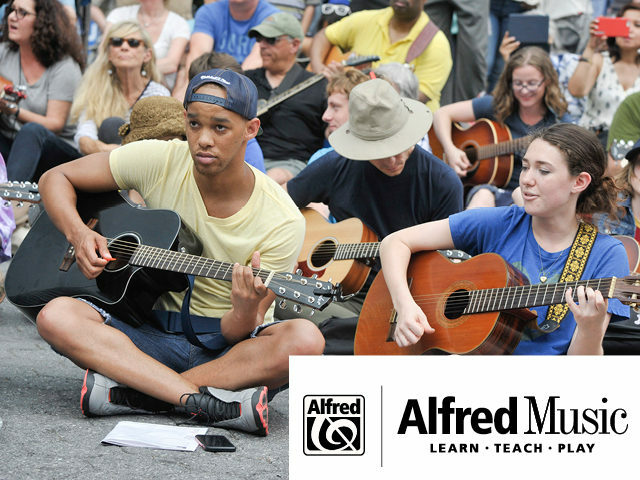 Alfred Music, a longstanding Make Music Day partner, returns in 2018 to support guitar and ukulele events nationwide. As part of the annual Mass Appeal series, Alfred Music is helping thousands of guitarists to rock out for Make Music Day. In dozens of cities, guitarists of all levels will come out for free lessons, and to play along in a massive strumming crowd. Free Alfred Music songbooks will be distributed to all, so that everyone can play along. This year’s songs will include “House of the Rising Sun,” “If I Only Had A Brain,” “She Loves You,” “Time Is On My Side,” “(I Can’t Get No) Satisfaction,” and “Ghostbusters”. In addition, Alfred Music is providing free copies of their book “It’s Ukulele Time” at more than 50 Mass Appeal Ukulele events, giving everyone a set of classic songs to play together.